Venomous Fish, Prefect Predators and Ray Bay, Oh My! Ripley’s Aquarium of Canada has so many amazing exhibits to surprise and even take your breath away from venomous fish to prefect predators and a ray bay, oh my! In these exhibits you’ll meet some that are hands off, some that are precious and endangered and all are sure to intrigue. The Gallery features a variety of delicate species from around the world in 6 salt water and 3 fresh water exhibits totalling over 50,000 litres. 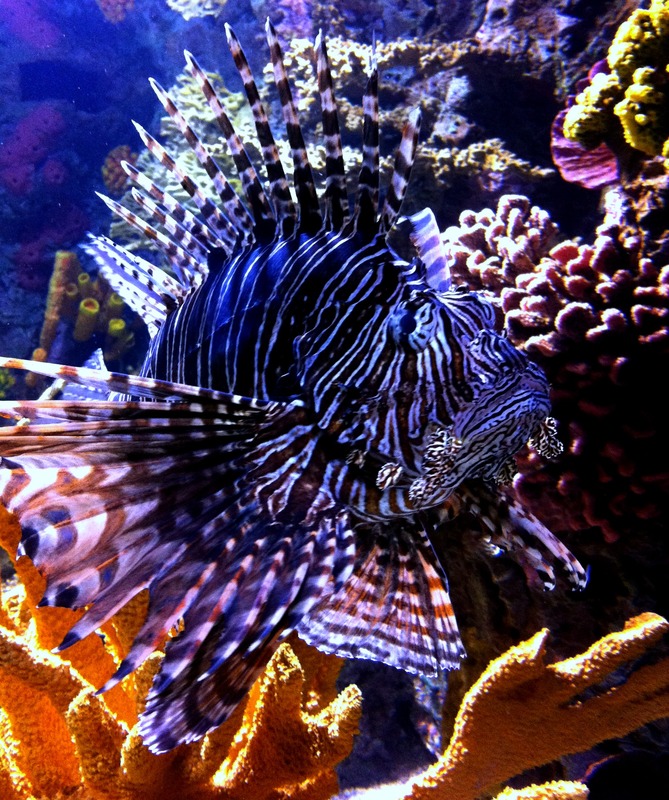 The most striking fish you’ll find here is the red lionfish. These beautiful fish look like a work of art with their loads of delicate fins, red colouring and fierce look, but they are venomous. Native to the Indo-Pacific coral reef waters, red lionfish can grow up to 15″ in length and are a solitary species. 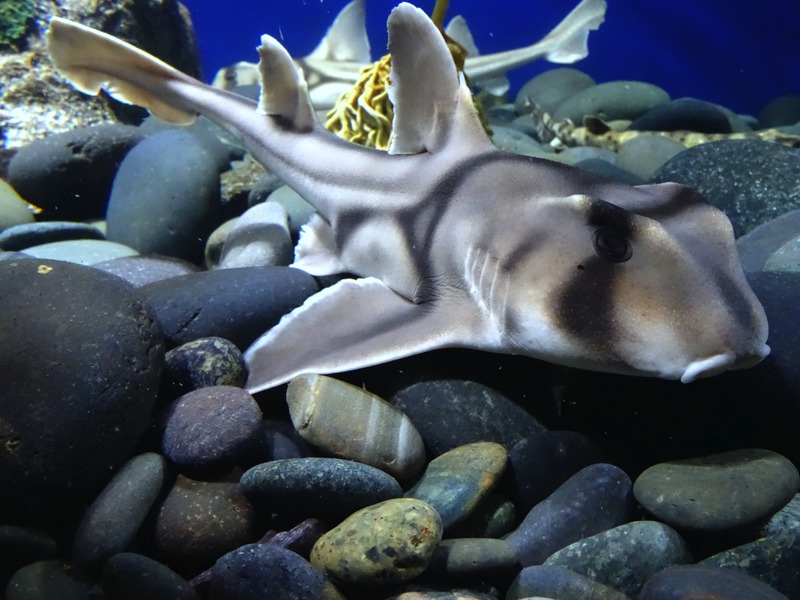 Surprisingly even with their, up to 18″ long venomous needle-like dorsal fins, they are a popular menu item. Another cool, or should I say excitable, creature found here is the electric eel. They’re not actually eels but are more closely related to carp and catfish. These air breathers can grow up to 8′ (2.5m) long, weighing 44lbs (20kg) and can generate a charge of up to 600 volts (5 times the power of a standard wall socket) to stun their prey or defend themselves. You may know all that, but did you know male eels make a nest from their saliva for the females to lay as many as 3,000 eggs? One of my favourite is the strange and sweet seahorse and here is the lined seahorse. Found in the Atlantic Ocean from Canada to the Caribbean, the lined seahorse has a life span of only 1 – 4 years. Sadly seahorses are endangered due to pollution and it being used in Chinese traditional medicine. Another similar and equally fascinating species is the leafy sea dragon with their leaf-shaped appendages all over their bodies that help them to camouflage in with the seaweed and kelp where they live, they look like fairy horses from out of a fairy tale. Endemic to the waters south and east of Australia, they are also endangered. 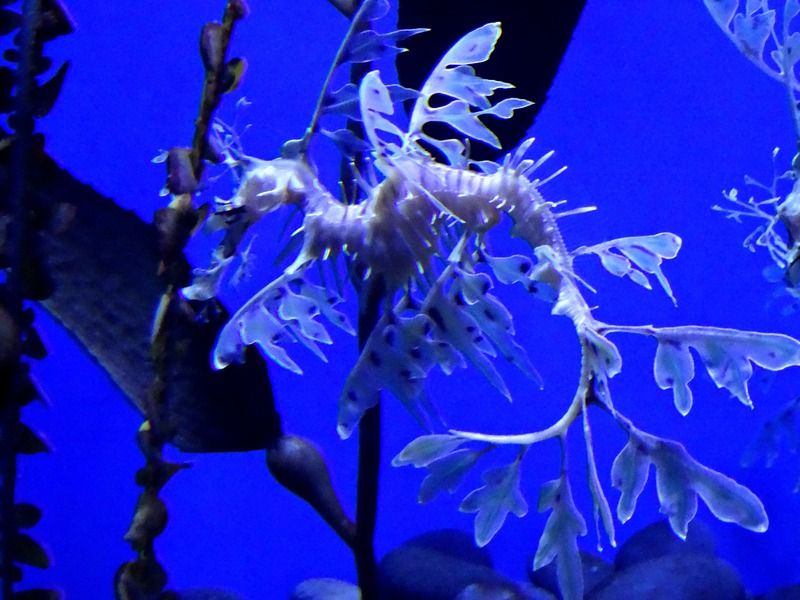 Unlike seahorses, who can wrap their prehensile tails around sea grass and corals, sea dragons can not and merely bob or waltz in the currents. From the beauty of The Gallery to the Perfect Predators exhibit you are first met by an interesting fish, the archerfish. The archerfish has a specialized mouth with its lower jaw jutting out and remarkably prey on land-based insects and other small animals by shooting water up to 3 metres above the water’s surface from their mouth to stun their prey. Wow! When you think of perfect predators I’m sure you think of the shark. With over 400 kinds of shark and the fact that they’ve been around for over 200 million years, sharks are an amazing animal and remarkable predators. The funniest looking shark you’ll find here is the wobbegong, the common name given to 12 species of carpet sharks. The word ‘wobbegong’ is believed to have come from an Australian Aboriginal language meaning ‘shaggy beard’, referring to the growths around their mouth. Two other cute little sharks you’ll see here are the California horn shark, whose eggs are like spirals making it easier to hide them in crevices, and the swell shark who can expand its body to almost double to prevent predators from pulling them out of hidden crevices. 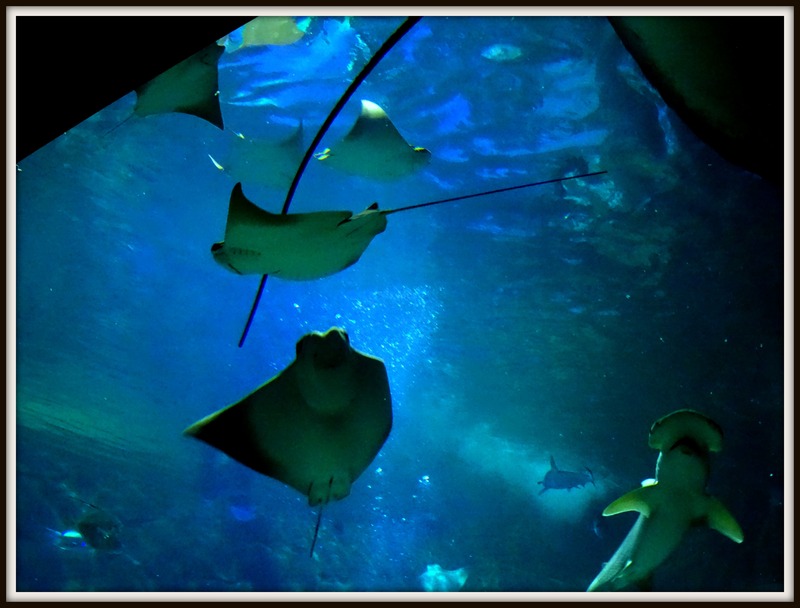 Then comes the dance of the rays in Ray Bay, an over 350,000 litre exhibit representing the salt waters of the Caribbean. Ray Bay offers daily shows that feature divers feeding and interacting with the rays and an educator on the outside to offer insights, informative and other cool facts about these rad rays. There are two species of rays here, the cownose ray, who swim in groups and almost look like birds in flight when seen from below, and the larger southern stingray with its powerful sense of smell and touch that help it find prey buried in the sediment. Among the rays in the Ray Bay you’ll also see bonnethead sharks – one of my favourite species of shark! The second smallest member of the hammerhead genus, the bonnethead sharks have a rounder head and only grow to between 30 – 48″ and up to 24lbs. Strolling through these exhibits you’ll realize not all fish look the same, nor are they harmless, some look like something out of a fairy tale while some look down right silly. One thing is for sure you’ll come away with a deeper appreciation for these fascinating species or at least will be entertained and brighter with a few new facts.